No, it’s not a bird or a plane; but the Public Laboratory for Open Technology and Science (Public Lab) did originate from a “super” idea that must have initially confused many people on the ground. After the devastating BP oil disaster of 2010, a group of environmental advocates, concerned residents, designers, and social scientists sought to fill gaps in information on the spread of oil along the coastline. To accomplish this, they flew balloons and kites equipped with digital cameras, affectionately named “community satellites”, over the spill to collect aerial images in real time. The Public Lab community members went on to gather data that produced high-resolution maps featured on BBC and New York Times! Public Lab was born out of this very successful effort. So when wetland restoration projects broke ground in the Lake Pontchartrain area, Public Lab expanded the network of participants in their initial project to develop a method to monitor the progress of restoration activities. These methods include routinely checking and documenting the different restoration projects occurring in the Lake Pontchartrain area. At times this means illustrating unsuccessful projects that result in regular flooding; other times it’s capturing flourishing post-Katrina restoration cypress forests, or sustainably restored parks that have become popular locations for community events. New Orleans residents have a historic connection to the many bayous, lakes, and waterways found throughout the vibrant city. Public Lab simply gave these natural-born water quality stewards the tools to actively engage in the restoration projects occurring in their backyards. Due to its geography and topography, the Lake Pontchartrain region experiences a disproportionate amount of flooding, runoff pollution, and contamination of toxic chemicals during natural and industrial disasters. In addition to being impacted by natural and industrial disasters, these communities are also affected by the lack of key neighborhood resources such as grocery stores, banks, and wide access to public transit. Aware that watershed devastation is often concentrated in areas dominated by low-income communities, Public Lab emphasized neighborhood participation in the areas that were most influenced by degradation. Improving wetlands in these traditionally overlooked areas has the potential to not only restore the watershed, but also to increase public investment to pool basic services into these communities. Lake Pontchartrain watershed residents are most directly impacted by the lack of green spaces, and are thus the ideal leaders to promote a cleaner environment. Public Lab’s program has helped forge relationships between community members and organizations doing wetland restoration, helping pave the way for more projects in volunteers’ neighborhoods. Digital mapping technology has evolved significantly in recent decades, with mapping becoming ever more powerful as tools for visualization and data analysis has become more accessible. Public Lab involved residents in the process of creating maps from start to finish. To train volunteers, Public Lab developed a curriculum on science, technology, engineering, and “Do-It-Yourself” aerial mapping that was easy-to-understand and equipped volunteers with the knowledge needed for monitoring. 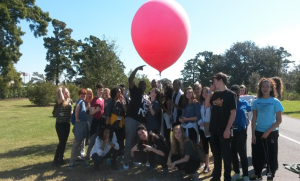 Volunteers went out into the field with kites, balloons, and other aerial photography tools to photograph New Orleans’ wetlands. These outings resulted in over 25,000 images from which volunteers organized and produced 18 maps and 7 pole map collages – a real-life application of Public Lab’s curriculum. To keep the citizen science collective abreast of new skills, they hosted bi-weekly volunteer “meet-ups” to share information about new tools and discuss the results of local needs assessments. Public Lab has utilized data collected from “community satellites” to build maps that capture the improvement of eight wetland restoration projects over the course of the program. On their interactive website, users can view several images melded together to create a high quality map of a site, coupled with a description of how that restored space is currently being appreciated by local residents. From the “Citizen-led Monitoring of Urban Wetland Restoration in New Orleans” program, Public Lab was able to cultivate a dynamic group of diverse individuals with a like-minded appreciation for the wetlands of their city. This was no small feat -to date, 367 individuals have participated in this program, having become aware of the project through community members, family, friends, and Public Lab partners in their neighborhood that encouraged them to join. This is a significant number of residents who are now empowered to participate in the transformation of sites important to them. In a post workshop survey, 100% of respondents said they would attend another Public Lab event in the future, indicating that monitoring wetland restoration in New Orleans is now in the right hands: the citizens’. The Public Laboratory for Open Technology and Science (Public Lab) is a non-profit community that develops and applies open-source tools to support environmental exploration and investigation. By democratizing inexpensive and accessible Do-It-Yourself techniques, Public Lab creates a collaborative network of practitioners who actively reimagine the human relationship with the environment. “Civic science” is a core Public Lab program that aims to increase the ability of underserved communities to identify, redress, remediate, and create awareness and accountability around environmental concerns.